Seen at the scene – Kyosho’s prototype RT6 stadium truck! 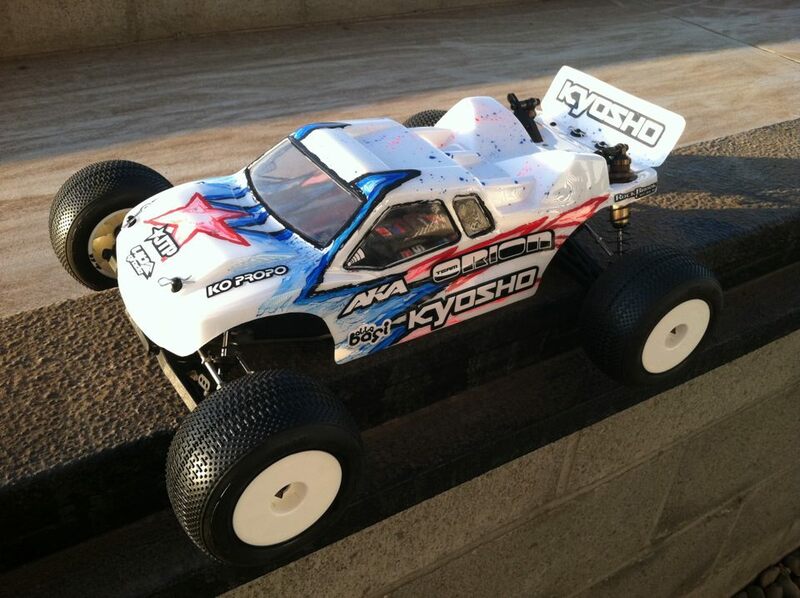 Of the several big stories shaping up as the IFMAR 1/10-Scale Off-Road Worlds Warm-Up gets underway at A Main Hobbies’ Silver Dollar RC Raceway in Chico, CA, one was uncovered while browsing Facebook last night – Kyosho team manager Joe Pillars posted this picture of Jared Tebo’s prototype RT6 stadium truck. Photo via Facebook – used with permission from Kyosho America. Details are nonexistent, of course, though we can assume the platform is based on the company’s RB6 2WD buggy. Joe’s caption for the photo was “He took it for a few laps around the track today and was dialed!” Look closely at the photo and you’ll notice that the rear of the body has been cut to allow the shocks to protrude; since the track was blanketed in sugar after yesterday’s practice was cancelled due to slippery track conditions it’s safe to guess that most of the teams will be going to a mid-motor setup whenever possible. Though the IFMAR Worlds will only recognize 2WD and 4WD buggy the warm-up race has classes for stadium truck and short course, as well as stock and modified divisions. Stay tuned to RCCarAction.com for more details as they become available.